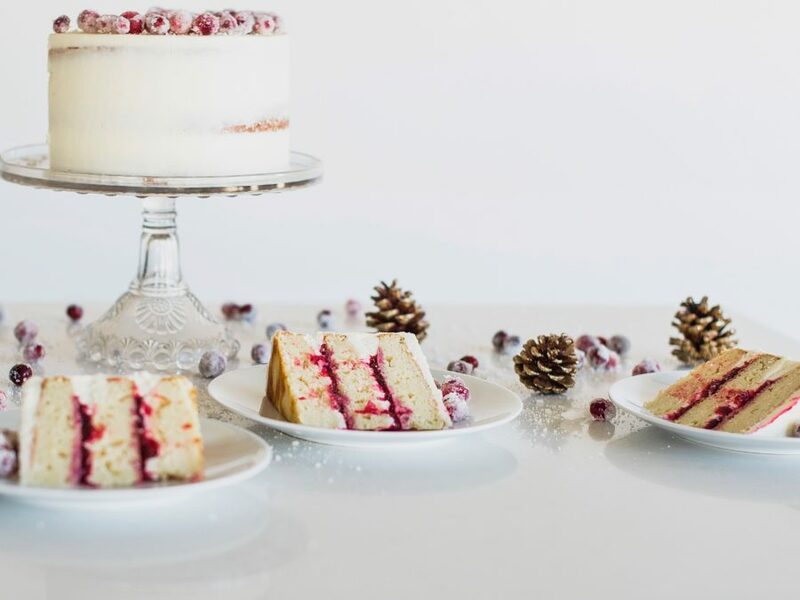 White Chocolate Cranberry Cake – Vanilla bean white chocolate pound cake with cranberry compote and white chocolate frosting. 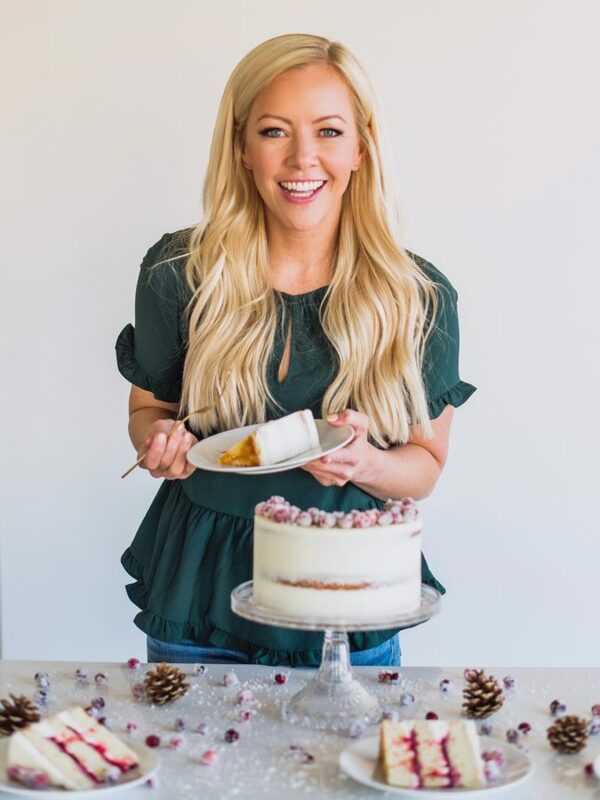 One of the many reasons I love the holidays is all the seasonal flavors I get to bake with! Pumpkin, apple, butternut squash, gingerbread, hazelnut, cranberry… there’s just so much to choose from! 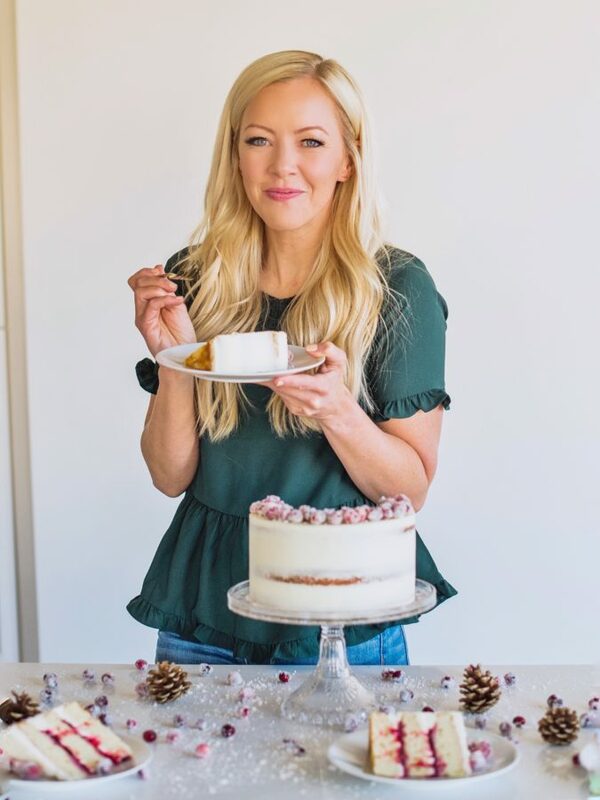 I’ve already shared a couple of these flavors with you (Pumpkin Pie Cake, Gingerbread Lemon Cake, and my White Chocolate Peppermint Cake – to name a few). And I just love them all! One of my favorites is an oldie but goodie. I came up with this recipe a few years ago. 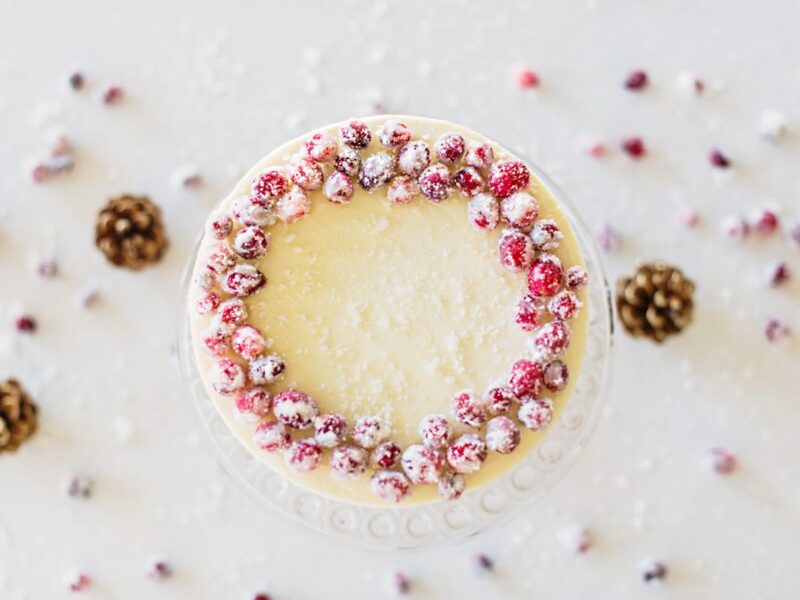 I think cranberries are the essence of Christmastime, and an obvious but delightful choice for any cake. 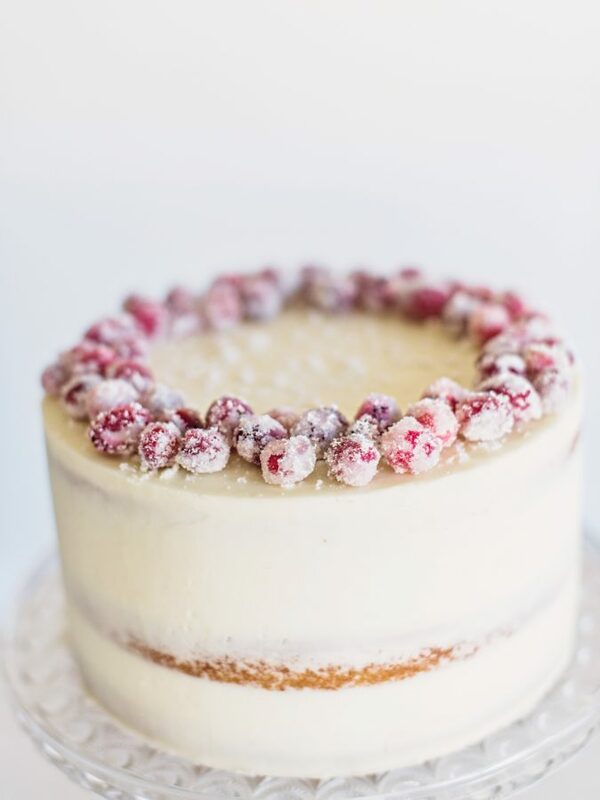 For this cake, I paired a tart cranberry compote with a sweet, white chocolate vanilla bean pound cake. This cake texture is a little different from my norm. It’s a much more dense cake than you’re probably used to. 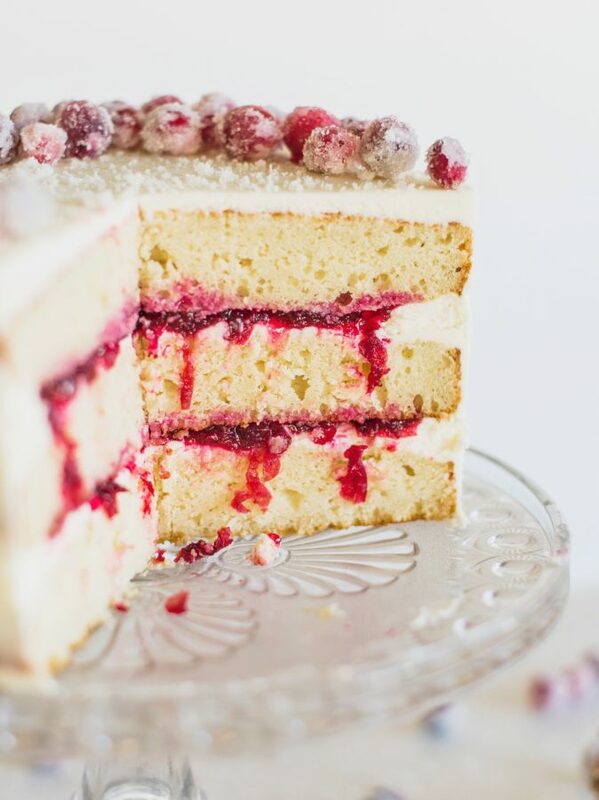 In fact, this cake actually reminds me of the Starbucks White Chocolate Cranberry Blondie Bar. While the texture is a bit heavier than most cakes, I think it balances so well with the jelly-like compote and the silky white chocolate buttercream. The flavor and texture combination in this cake always get thumbs up from my taste testers. I have no doubt you’ll love it too! 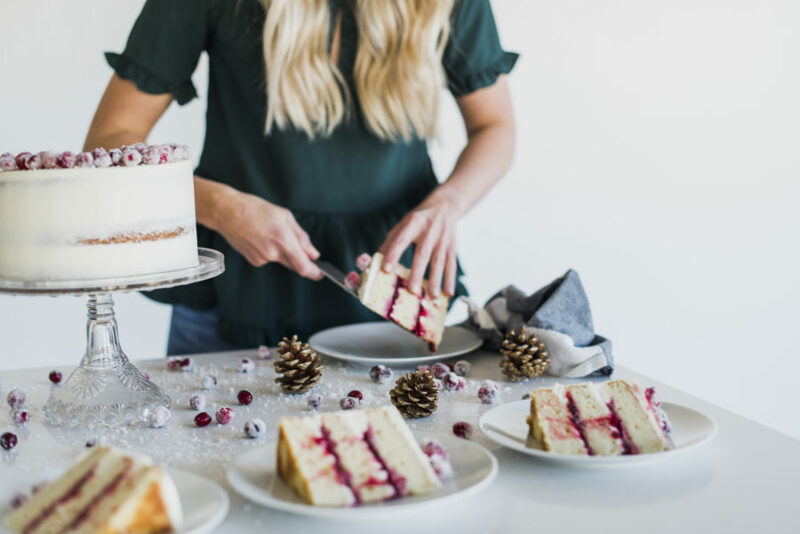 For this cake, it’s important to note that you add some buttercream on the cake layer, as well as pipe some of the frosting around the cake layer before you add the compote. You want to make sure the compote doesn’t seep into the cake layers or come out the sides while you frost. I then did a semi-naked coat of frosting on this cake. 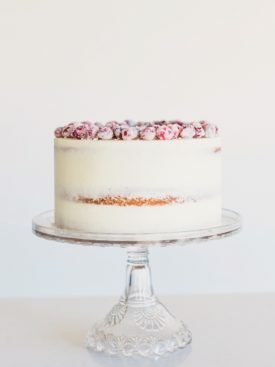 To achieve this look, I actually did a very thin crumb coat first, then froze the cake per usual for about 10 minutes. After this initial crumb coat was frozen, I then did another thin layer of frosting – almost like another crumb coat. (You can find the video tutorial at the end of this post). I’ve also included the recipe for the candied cranberries, which I think make the look of the cake. Such a sophisticated, classy look, don’t you think? 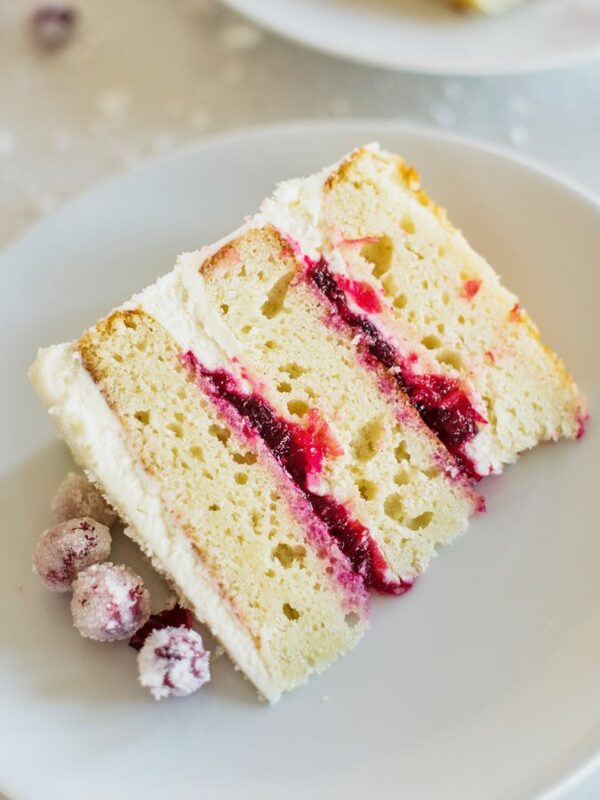 White chocolate vanilla bean pound cake with cranberry compote and white chocolate frosting. Bring the 1 cup of water and 1 cup of sugar to a simmer in a saucepan. Simmer until sugar is completely dissolved. Pour the simple syrup into a heatproof bowl and allow to cool for about 10 minutes. Add cranberries and stir to coat. Refrigerate cranberries during the day or overnight, stirring occasionally to coat with syrup. Remove cranberries from syrup and roll in remaining 1/2 cup sugar. You'll need to roll them a few times to get a couple of layers of sugar on them. Set cranberries aside to dry for an hour or so. Preheat the oven to 350 degrees F. Prepare three 8-inch cake pans with spray, parchment paper and spray again. Set aside. Cream the butter and the sugar on medium speed in a stand mixer fitted with the paddle attachment for one minute. With the mixer on low, alternately add the flour mixture and the buttermilk, starting and finishing with the flour. Combine until incorporated. Stir in the vanilla extract and vanilla bean and mix for 30 seconds. Evenly distribute the batter among the three cake pans and bake for 30 to 35 minutes or until a toothpick inserted in the center of the cake comes out clean. Let cool in pans 5-10 minutes before inverting onto a wire rack to cool completely. Once cooled, you can cover with plastic wrap and store in your refrigerator overnight or freezer for longer. Pour the white chocolate pieces or chips into a microwave safe bowl and microwave for 60 seconds. Stir and, if needed, microwave for another 30 seconds. Set aside and let cool. With the mixer on medium speed, add the melted white chocolate and stir until well mixed and there are no clumps of butter or white chocolate left. With the mixer on low speed, gradually add the sifted powdered sugar until incorporated. Scrape down the sides of the bowl and continue to mix for another minute. Add the heavy cream, one tablespoon at a time. Once the cream is incorporated, add the vanilla and increase the speed to medium-high and beat the frosting for five minutes. It should get lighter in texture and color. Level cake layers if needed. Place the first cake layer, right-side up, on a cake board or plate. Spread about 3/4 cup frosting on the cake. Then, using a pastry bag, pipe a barrier around the edge of the cake. This is done to ensure the cranberry compote won't ooze out the side of your cake as your stack. Spread about 1/2-3/4 cup cranberry compote around the open space. Place second cake layer on top of the compote and repeat step 2. Place third cake layer, bottom-side up, on top and give the cake an even crumb coat. Chill it in the freezer for 10 minutes and then continue frosting. (While cake is chilling, I like to cover my frosting with plastic wrap so it doesn't have a chance to dry out). Actually, this cake is supposed to be dense. It’s a pound cake texture. What other fruits can we use the same sparkling cranberries recipe? You could really try anything, just be careful when pouring the simple syrup over the other fruit since it doesn’t have a “shell” like the cranberries. Can’t wait to make this can it also work as cupcakes? I actually haven’t tried it as cupcakes, but I think it will. Do you think this would work well with your regular vanilla cake? I’m thinking vanilla cake, compote and white chocolate buttercream filling, vanilla buttercream exterior…? I would wait till the last minute to put them on. I would also freeze your cake until the night before the reception, then move it to the fridge until you drive up. That way it’s still pretty cold as you travel too.